Gently simmer some spring onions in oil to make a wonderfully aromatic seasoned oil. I was in Changsha, Hunan province, over the summer to visit some tea estates and also to see my brother who is stationed there. In the sweltering 40°C heat the whole city of 7 million people was suffering and feeling lethargic. I drank a lot of the local green tea because perspiring actually helps us to cool the body. Along the same lines, spicy food can really help in these temperatures. All over Changsha street hawkers were selling ‘Liang Fen’ (凉粉). This is a tossed noodle salad with coriander, cucumber and a truly mouth-numbing red chilli oil. Maybe I’ve lived in London too long and so literally can’t take the heat any more, but just one look at this chilli oil made me want to rush for a vat of milk or yoghurt to soothe the inside of my mouth! This reaction was somewhat to the disgust of the hawkers, or ‘aunties’, who’d mutter that there was no point eating Liang Fen without lots of this devilish hot dressing! My wonderful Mom has a safer way to spice up a noodle salad! Since I was a kid she would fry shallot oil, rendered pork lard and spring onions to make a gorgeous spring onion oil that just adds a tasty punch to salads and other dishes. Let the spring onions wilt slowly to impart their flavours into the oil. Making it couldn’t really be easier, and it can be vegetarian or not, according to your taste! Just clean, then dry, a bunch of spring onions, leaving the roots on if you like – I do not, by the way, understand why there’s so much dirt on the spring onions sold in the UK – then cut them into chunks so that they will fit into a saucepan. Heat about 250ml of oil for a vegetarian version or else pork lard, then lower the heat to 80-130°C; that’s bare heat from the surface of the oil – what Chinese chefs call ‘san cheng’ to ‘si cheng’ i.e. three-tenths to four-tenths heat (heat control in Chinese cooking is a rather intuitive thing, as traditionally chefs didn’t have glass available so there were no thermometers). 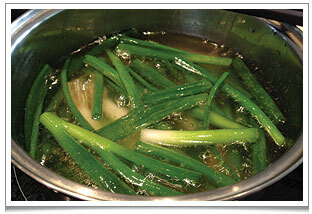 Add the spring onion chunks into the oil and allow to very gently simmer away for 10-15 minutes. The spring onions will wilt slowly, turning from a jade green colour to a mellow, limp yellow, and their flavour will infuse into the oil. Briefly turn the heat up very high then remove the spring onions from the saucepan. Let the aromatic spring onion oil cool and store it in a glass jar in the fridge – it can last there up to 2 weeks. 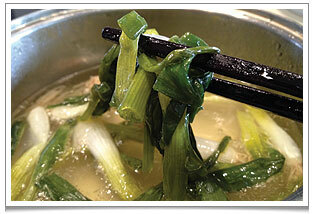 Do not throw away the wilted spring onions. When you want to use them – for example I’ve added them to a potato salad or as a topping on soups – just chop them finely with a spoonful of the spring onion oil. Absolutely delicious! For a noodle salad, choose a thicker type of noodle, such as egg noodle, udon, soba or spaghetti. Cook in the usual way, toss them (either while hot or once they’re cold) in the spring onion oil then add a touch of soy sauce, freshly chopped spring onions, rocket leaves, chopped peanuts and chilli oil (optional, like all the ingredients). Some tahini would work too though the dressing is already deliciously fragrant without. If you want, soak some large Chinese or Korean dried shrimps in water for 2 hours, then drain and steam them in Shaoxing wine for 20 mins and add them to the noodle salad to make a very simple midweek dinner or to take to the office and make your envious colleagues drool!